E-Zee Set louver shutters come in both fixed and operable louvers and both shed rain, allow air transfer, filter direct sunlight, protect from small flying debris, and provide privacy. Operable louvered shutters allow for greater control in light and ventilation. Traditional louver shutters are built using mortise & tenon construction. They feature square edge stiles and rails and “flush face” design (all stiles and rails are the same thickness). True louver shutters are fully customizable; almost any part can be modified and located to suit your needs. Louvered shutters can be used in a variety of interior and exterior applications. Some of the exterior applications include louver exterior doors, standard operable shutters and Bermuda shutters. 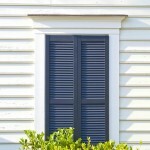 Premium Louver shutters are offered in either pine or cedar. Elite Series are available in Cedar only. Select the style and series of shutter below for a complete details. Elite Series louver shutters are made using only the finest and most sturdy materials. 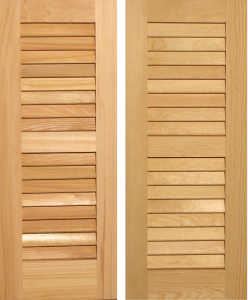 Traditional true louver shutters are built using mortise & tenon construction. They feature square edge stiles and rails and “flush face” design (all stiles and rails are the same thickness). True louver shutters are fully customizable; almost any part can be modified and located to suit your needs. Elite Series shutters are thicker, stiles and rails are wider and have the appearance of a more substantial and heavier shutter.